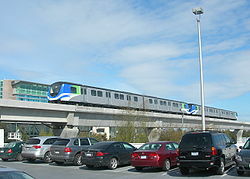 The Vancouver rail-based public transportation system after the opening of the Evergreen Line extension of the Millennium Line. 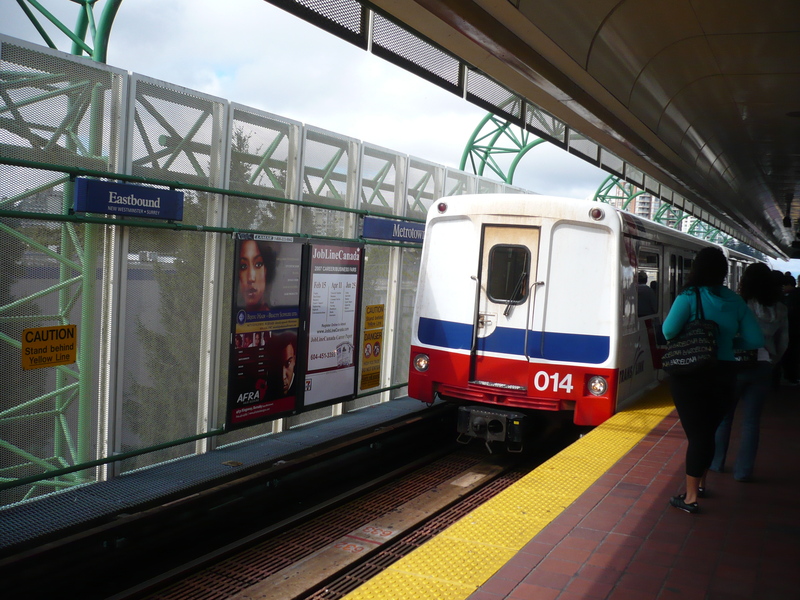 The route designations E1, E2 and M are for convenience only, and are not used by TransLink. Vancouver streetcars: (electric) 28 June 1890 - 21 Apr. 1955. North Vancouver streetcars: (electric) 1 Sept. 1906 - 23 Apr. 1947. Interurban trams: (electric) 3 June 1891 - 28 Feb. 1958. SkyTrain (automated LRT): 3 Jan. 1986 - today. Canada Line (Metro): 17 Aug. 2009 - today. Vancouver and North Vancouver streetcars: 1453 mm. SkyTrain / Canada Line: 1435 mm. The Transit Museum Society runs vintage interurban streetcars between Granville Island and Science World on weekends and holidays during the summer months. 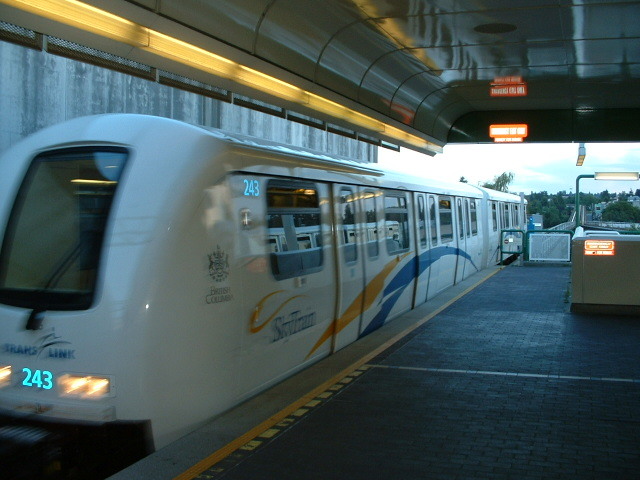 A demonstration service by modern trams from Europe was run on the same line during the 2010 Winter Olympics held in Vancouver. Cockle, D. "Tram-train community rail for Fraser Valley", Tramways & Urban Transit, Dec. 2010 (73: 876), p.465-466. Conn, H. & Ewert, H. Vancouver's glory years: Public transit 1890-1915. North Vancouver: Whitecap Books, 2003. "End of city trams in Vancouver" (news item), The Modern Tramway, July 1955 (18:211), p.142. Ewert, H. The perfect little street car system. North Vancouver: North Vancouver Museum and Archives Commission, 2000. Ewert, H. The story of the B.C. Electric Railway Company. North Vancouver: Whitecap Books, 1986. Guide to Vancouver. Vancouver: British Columbia Electric Railway Company (BCER), 1930. Hyde, R. The Sockeye Special: The story of the Steveston tram and early Lulu Island. Richmond (B.C. ): Author, 2011. Kelly, B. & Francis, D. Transit in British Columbia: The first hundred years. Madeira Park (B.C. ): Harbour Publishing, 1990. Simons, V. "Vancouver prepares for the Winter Olympics", Tramways & Urban Transit, Jan. 2010 (73: 865), p.11-13. Till, H. Diary of significant events in the history of B.C. Electric's transportation system, 1889-1946. Vancouver: B.C. Electric Co., 1947 [?]. 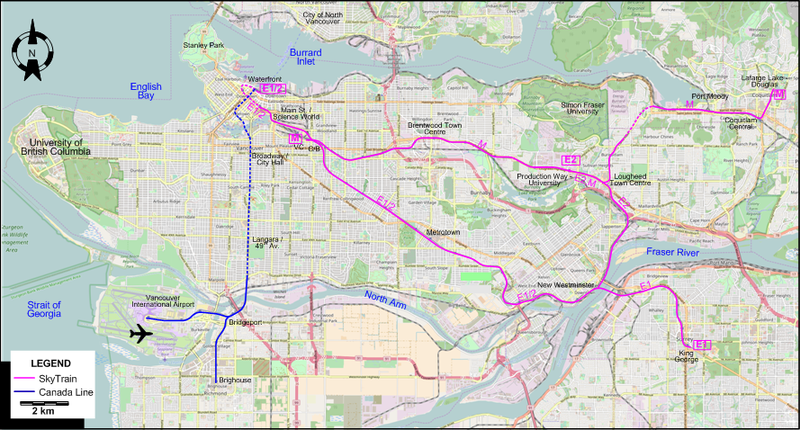 Transit System Map of Vancouver, B.C. [Vancouver]: Challengers Cartographers, 1949, 1952 and 1954.